If you’re seeing this blog post, I am assuming you’re interested in learning of some sparkler exit alternatives for a wedding! Look no farther, because there are options for day or night you can use. Everything doesn’t have to be bubbles and sparklers, just remember to check with your venue to see what you’re allowed to do. The times an exit is usually a great photo op are right after a couple is walking down the aisle after being pronounced, when a couple is leaving the church and guests are standing outside waiting, and towards the end of the night or at the very end of the night when the couple is leaving. I typically recommend for outdoor ceremonies for the couple to kiss and when walking down the aisle, have the guests use the required item. Have the officiant announce for everyone to get ready with _____ and that way they remember to use them! When an officiant does not announce it, guests get caught up in the romance and forget to get everything ready. 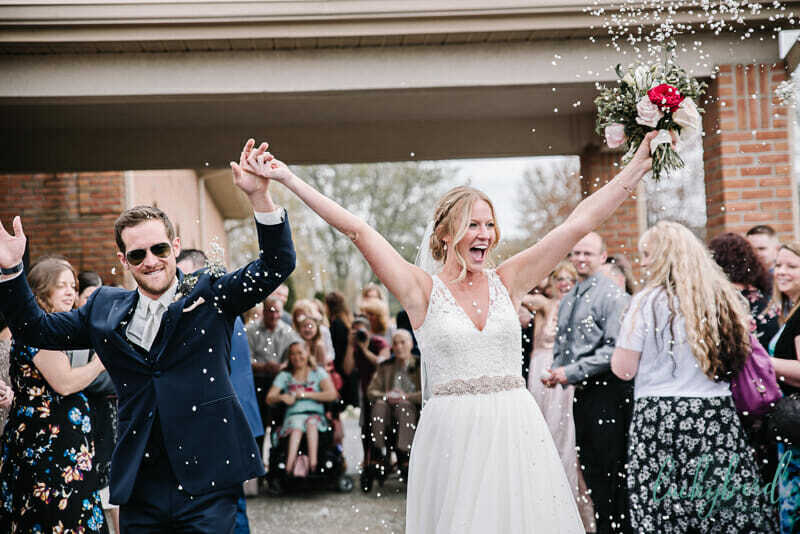 What happens is a few people remember and then everyone starts to remember as the wedding party and family are walking back down the aisle for the recessional – making great photo ops for them and just a meh one for you. For ceremonies, bubbles, ribbon wands, lavender, rose petals, and baby’s breath photograph well. Glitter also photographs VERY well, but please please please buy biodegradable glitter if you are using it outdoors. For receptions, ribbon wants, sky lanterns, and glow sticks can be AMAZING. Of course, sparklers are an option, but please check with your venue about their fire policy. For sky lanterns, again, please get a biodegradable option that is wire-free. Gotta think of the animals and the environment, everyone! Here’s a photo of an exit using baby’s breath – it showed up very well in photos!